Dreamscape in 'The Galleries' is an exclusive apartment, with arguably the best views and position in all of St Ives, sitting above The Tate Gallery looking over Porthmeor Beach, with absolutely fantastic panoramic sea and coastal views from Clodgy Point to The Island. It has underground private parking with lift access. 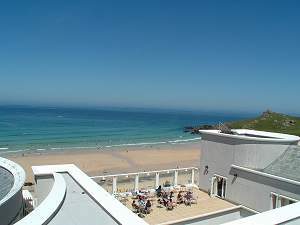 It is a short walk from the harbour, all the beaches (Porthmeor, Porthgwidden and Porthminster) and all the shops, restaurants, pubs, museums and galleries that St Ives has to offer. This 2 bedroomed luxury apartment is finished to the very highest standards, including real oak flooring throughout (except bathrooms) and full gas central heating with underfloor heating. Main bedroom - with a king-size sleigh bed, fully fitted wardrobes, stunning beach and coastal views, separate ensuite fully tiled/mirrored shower room, with wall hung wc, basin and heated towel rail. 2nd bedroom - with 2 single beds, fitted wardrobes and views over Barnoon. Main bathroom - fully tiled/mirrored with oversized bath, shower, wall hung wc, basin and heated towel rail. Lounge - cream leather 3 piece unit, large plasma screen with digital TV, DVD, CD, VCR, hi-fi unit, lighting and coffee tables. Views from here are stunning. Dining area - dining table and 4 chairs. Kitchen - granite worktops, with AEG gas hob, electric oven, extractor, microwave, fridge, freezer and fully fitted units with all your eating/cooking utensils, including toaster, coffee percolator, kettle etc. Breakfast bar patio - separate indoor/outdoor area with spectacular seating and views. Outdoor patio terrace - large eating/relaxing area with luxury patio set and sun lounger. Dreamscape rents from Friday to Friday throughout the year and includes all quality bed linen, gas, electric and car parking for one car.